The towering vista of Mount Kenya provides an unlikely backdrop to a tech-savvy Kenyan restaurant that has embraced crypto-currencies as a form of payment. Betty’s Place specialises in “nyama choma”, a lip-smacking goat meat barbeque that is a firm favourite amongst Kenyans. Located in the rural town of Nyeri, about 150km (90 miles) outside the capital, Nairobi, it is one of the few businesses in the country that allows customers to pay with not one but two crypto-currencies – Bitcoin and Dash. “Since the world is becoming more global, my place is also becoming a global restaurant,” says Beatrice Wambugu, the owner of the restaurant. Ms Wambugu started trading in Bitcoin two years ago and and within a year she made enough money to buy the two-storey Nyeri hotel, which she converted to Betty’s Place. Located on Nyeri town’s busy main road, the restaurant is unmistakable with its bright mustard-coloured walls and big glass windows providing a welcome invitation to hungry patrons, who are greeted by a pleasant aroma of meat on the grill and the sounds of local music. Betty’s Place is not only a place for tasty Kenyan cuisine, but it has become something of a local attraction for people wanting to know more about Bitcoin. When it comes to embracing new technology, Ms Wambugu describes herself as “a crypto-currency pioneer”. However, her payments in Bitcoin have been modest – about 30,000 Kenyan shillings (£230, $300) in sales from about 20 people. “I’ve set aside one day where I can teach my customers. Whoever asks about crypto-currencies: ‘How does it work? What is Bitcoin?’ I train them,” she says. Mobile phones make paying with crypto-currency at Betty’s Place and other retailers easy. In Africa the mobile phone has been instrumental in transforming the way people conduct business, and the growth of Bitcoin could one day rival mobile banking platforms like M-Pesa as a viable form of payment. Bitcoin presents an “opportunity to do what people are calling ‘banking the unbanked'”, says James Preston, head of the publication SA Crypto, referring to more than 350 million Africans who do not have access to traditional forms of banking. “There’s been such a history of poverty in Africa that so many rural communities are yet to be developed with normal banking infrastructure,” he told the BBC. 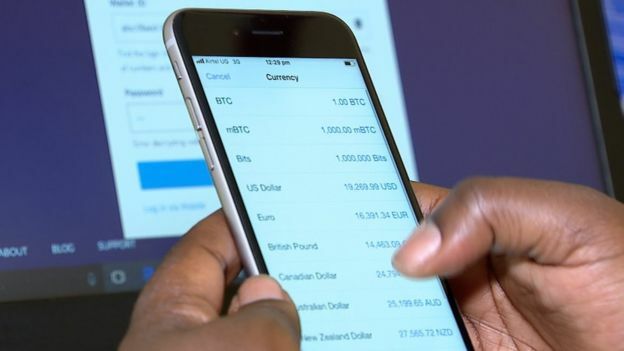 “Now all of a sudden they can get a Bitcoin wallet on their phone and in essence they can have a bank in their phone, and that’s what crypto-currencies and crypto assets do, they allow you to be your own bank,” he told the BBC. The surge in popularity of Bitcoin and other crypto-currencies has led many experts to believe that Africa will once again leapfrog the digital divide, bypassing traditional banking much like it did with the fixed-line telephone. According to the African Development Bank, smart phone penetration is set to hit 50% by 2020. Yet even in the famed Kenyan tech hub of “Silicon Savannah” there are few if any businesses that allow customers to buy with Bitcoin – and there are cautionary tales. Peter Oduba, a would-be investor from Kenya, fell for a Bitcoin Ponzi scam called Crypto Wealth and lost a significant amount of money in the process. He told the BBC the scam had involved “six pots” investors could “jump into”. “The first pot when you get in, you have to bring two people, then those two people bring in another two,” he explained. “Once the other two bring more people it means you have like seven or eight people, which means once you have seven people, someone has to jump to the next pot.